← How Does Online Scheduling Minimize Customer No-Shows? The entire consumer world is being taken over by the Internet, and that includes auto mechanics. The auto mechanics that choose to embrace the Internet are the ones that will expand their business and get more local referrals. One of the features that an auto mechanic’s website needs to include is an online scheduling feature. Even for the customers that are not sure what they need to have done to their cars, an online appointment function can be helpful. Some auto repairs are major jobs, and some are minor. When you allow people to schedule their own appointments, you can allow them to choose from a menu that includes standard actions such as an oil change or tire rotation. For more serious jobs, you can allow customers to choose a diagnostic appointment that will allow you time to answer all of their questions and diagnose the problem. This will help you to know exactly what customers are coming in for and can help you to keep your business organized. An auto mechanic’s shop requires a lot of different supplies to keep running such as oil, filters and parts. When you utilize an online scheduling function for your auto mechanic business, you can know in advance what supplies you will need for the coming week. It allows you to do a more accurate inventory and make sure that you always have the supplies on hand that your customers need and that you need to run your business. Many of your customers know what kind of auto repair appointment they want. For them, it is just a matter of getting through on your phone line to make the appointment. When you have an online scheduling feature on your website, it prevents your regular customers from the hassle of having to wait on hold or waiting until your phone line is open to make an appointment. All your customers have to do is make the appointment online and then they can get on with their day. In most auto mechanic shops, there are mechanics that are better at certain jobs than others. When you have an online scheduling function for your mechanic business, you can assign the right mechanics to each customer appointment and increase your level of customer service. You will also increase employee morale when you are able to match up each mechanic with the particular job that he is good at. 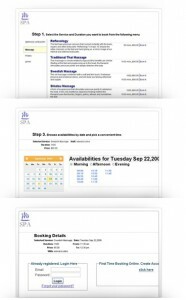 Visit http://www.timepicks.com to learn ways to improve your business with online scheduling.